I’ve been talking to you a lot about bringing light to a dark place, this season, by lighting a single candle. Today I want to show you the secrets of ancient lighting — how they brought light into the dark places thousands of years ago. The olive oil lamp is the kind of lighting that was used in the Holy-land 2,000 years ago. Olive oil is an ancient lamp oil. It is the oil that was used in the Temple Menorah during both the first and second Temples in Jerusalem. It was the oil that brought about the miracle of Hanukkah during the time of the Maccabees — over 150 years before Jesus was born. It is the oil that Jesus/Y’shua studied the Holy Scriptures by, in his childhood home in Nazareth. When Jesus said “You are the light of the world,” He was making an analogy using the olive oil lamp — a light that burns brightly in fresh oil. When he told the parable of the wise and foolish virgins, again, he mentions their olive oil lamps. Think about that for a second. A light that comes from a flame fed by fresh oil. Olive oil burns cleanly, without smoking. It doesn’t spread toxic hydro-carbons into the air. It’s inexpensive and plentiful, if you grow your own olives. Even if you have to buy your olive oil, it’s not hard to find and not extremely expensive. Olive oil grows on trees — olive trees. Olive oil is a renewable lamp fuel. For burning as lamp oil you can use cheaper grades of olive oil, like pomace olive oil, rather than the expensive extra virgin oil. Buy a trusted brand, as you want pure olive oil not olive oil that’s been adulterated with canola oil or other GMO oils. Ancient olive oil lamps are shallow dishes of oil with a wick or rag held upright. These clay olive oil lamps were small bowls. They had a pinch of clay at one side of the bowl to hold the wick upright, just above the surface of the oil. If you don’t have a handy clay olive oil lamp kicking around your kitchen, you can make a wick holder with wire. The wick needs to be close to the surface of the oil, as olive oil doesn’t have fumes to keep the wick burning, while fresh oil enters the burn zone. Plan for a flame about 1 inch above the surface. 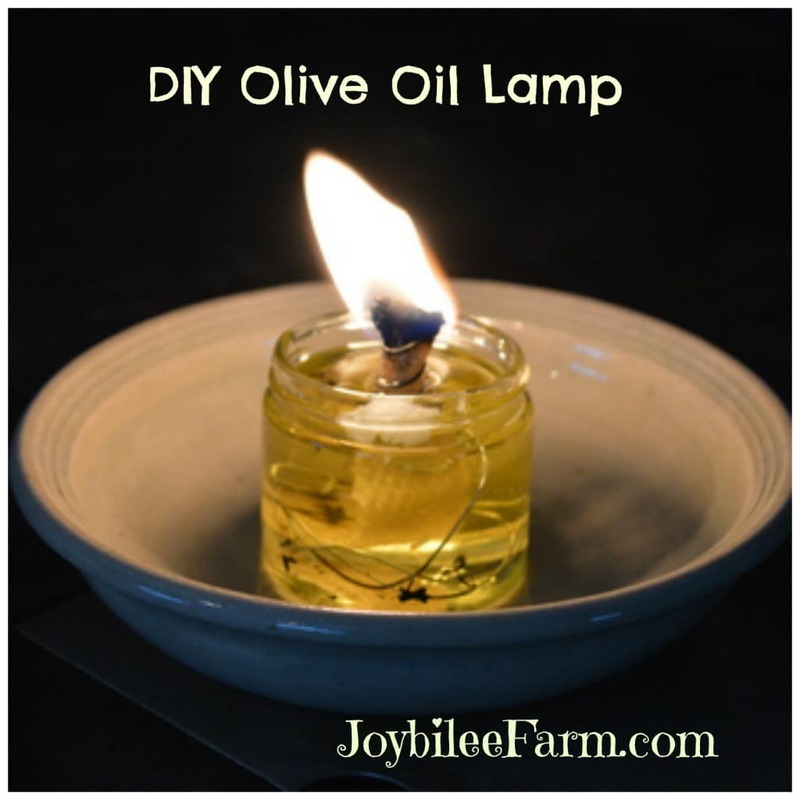 To make a lamp you need a wick, something to hold the wick upright and keep it from dropping into the oil, a vessel to hold the oil, and pure olive oil. The wider the wick that you use, the brighter your lamp will be. I like to use a braided wick such as is used in a kerosene lamp. These draw up the oil evenly, and give enough light to read by. The olive oil lamps available from Lehman’s are made to use a small round candle wick and only give as much light as a candle. Ancient olive oil lamps used linen rags soaked in oil and gave a lot of light. No worries about setting the whole house on fire with an olive oil lamp. Unlike kerosene, olive oil won’t ignite if the flame drops down into the oil — in fact it will smother the flame. It’s quite amazing that olive oil will burn at all. Unlike kerosene or paraffin oil, there are no fumes to burn. If the lamp is tipped, the oil will smother the fame in an olive oil lamp. Whereas kerosene and lamp oil will ignite and spread the flame. The light from an olive oil lamp is bright enough to read by. It’s as bright as a kerosene lamp, with a warm yellow flame. Using pliers cut a 15 inch length of wire. Roll one end of the wire tightly around the nose of the pliers 4 to 6 times. Move to the other end of the wire and wrap a circle that will fit into the bottom of the jar that you’ve chosen for your lamp. Wrap this circle several times with the wire to make a firm foundation for your wick. 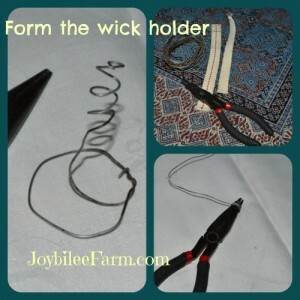 Using tweezers, feed your wick through the circle made by the pliers, and pull through the top as in the photo. Place the wick in its holder in the jar. 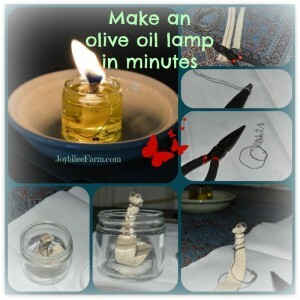 Fill with olive oil to within one inch of the top of the wick. Allow the wick to absorb olive oil to the top of the wick. This may take 10 minutes or more. Once the wick is saturated, light the wick with a match or candle. It will start with only a small flame. The brightness of the flame will increase as the wick draws up oil into the flame. This may take a minute or two. 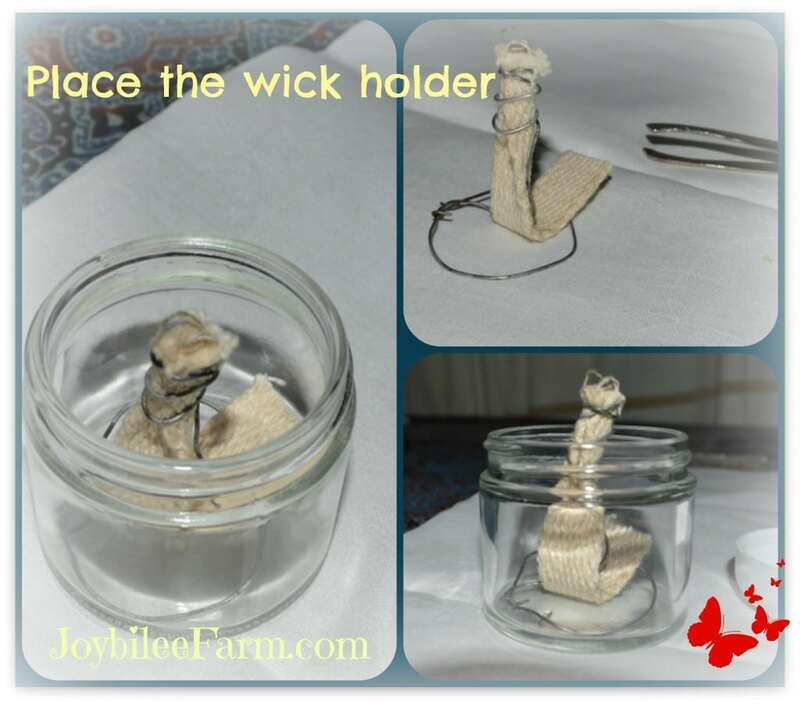 Trim the wick and pull a clean edge up into the top of the holder, each time you light it. A small amount of oil — about 60mls or 2 fl. ounces will burn for several hours. As always, use precaution around an open flame. To extinguish the flame, snuff with a candle snuffer or a metal lid. Don’t lick your fingers and try to snuff it out — you’ll burn your fingers. The jar and the oil won’t heat up from the olive oil flame, but keep it on a nonflammable surface as a precaution. Let me know how yours turns out. You can drop me a note on my Facebook page. Previous Post: « Jelly doughnut mystery solved! I was given a replica of the handheld clay oil lamp with a hole for the wick on one end. At the time the giver said it could actually be lit if you added a wick and olive oil. I am excited to try it. My concern is extinguishing, since it won’t have a jar lid and I don’t have a candle snuffer. Can I use freezers and just pull the burning wick back down into the oil? nice write up but few things. hurricane lanterns are made to extinguish when tipped over and they have no open flames. also, you can drop a match into kerosene and it will extinguish the match, it’s not like gas. also, people been using kerosene type lamps for centuries . the air we breathe in general is bad. BTW, Kerosene won’t burn by dropping a match in a can of it either. Good to know. I haven’t tested it. Hi Chris, I figured out a few years ago how to take a punch glass, put some water in it and then some olive oil. I’ve then took a clear plastic lid from a ketchup container for Fries, turned it upside down, made a small foil circle for the center punching a hole in both. I then stuck a stiff 1/2 inch wick that is used in Greek sactuary candles. I lit the bottom end 1st since it made the wick take up the oil immediately. Then I blew it out and let the top. It has worked like a charm and I keep it lit almost all the time. My concern is that I have had very clogged nasal passages and I am beginning to wonder if the oil diffused in the air by the flame would coat the nasal passages to create this problem. Do you know of this at all? Can you offer any wisdom here? That’s ingenius, Cynthia. Thanks for sharing. I’ve never heard of olive oil coating the nasal passages, but it might. I would think if you were using canola or another rancid, high iodine value oil, that would be more likely. Have you tried a salt steam to clear your sinuses? That’s what I do when I have sinus congestion. (1/2 cup of himalyan salt plus a bowl of boiled water and essential oils like eucalyptus, tea tree, marjoram, lavender or a citrus oil for their antiseptic benefits. I’m assuming you’ve already talked to your doctor about it. Thanks Joybilee Farms, happy to share. I will try the salt steam! Speaking of Himalayan Salt..I found a recepie that mixes 1tsp Himalayan Salt with 5 tsp. organic raw honey (or Manuka) once well blended, put small amount under tongue before sleep and let dissolve… the minerals energuze & renew the body while providing deep, restful sleep! Hello, …do the classic oil lamps with flat wicks adapt to use olive oil? I tried …and it burned the wick quickly down…like an inch per hour….any way to get modern oil lamp to work with olive oil?…. No, unfortunately they don’t. Lamp oil and liquid paraffin oil have volatile fumes that draw up the wick and keep the light on. Oil lamps take advantage of this attribute, that is shared by kerosene. Olive oil doesn’t have any volatile oils, so the wick needs to be sitting pretty close to the fuel source in an olive oil lamp so that the wick can “wick” the oil and keep the flame burning. I want to do this. That looks like a thick wick. Does it have to be a jar,or can it be an aluminum can? Can you get wicks at Michaels? The wick is a braided wick like you’d use in an oil lamp. You can use a can. I’m not sure about Michaels but Lehman’s carries the wicks. Costco carries plain olive oil, right next to their extra virgin. Can you put scented oil in an olive oil lamp??? Scented oil is what is used in kerosene lamps. That would be a fire hazard in an olive oil lamp because the flame actually touches the oil. You could put a few drops of essential oil into the olive oil though, if you wanted scent. I wonder if using an herb infused olive oil would add a noticeable fragrance to the room, I think I’ll give it a try. I added a bit of eucalyptus essential oil to the olive oil today and you could faintly smell it as it burned. Thanks for your kind words. I add fragrance oil or essential oils too…. I’ve made a lamp with olive oil in half an orange peel before and think it’s so neat that it will burn! I was wondering about using it in a regular kerosene lantern but can’t find any stories about that online. Maybe it won’t work since the wick is saturated with oil but it’s a fair bit away from the oil pool? Has anyone tried it or heard of it working? Eventually I’ll give it a go but not until such a time as I’m ready to wash out a greasy kerosene lantern if it doesn’t work, lol! I did try it and the wick ends up being too far from the source of the oil to draw olive oil up properly. I’ve used kerosene and paraffin lamp oil successfully in the kerosene lamps though. Both have fumes that also feed the flame.